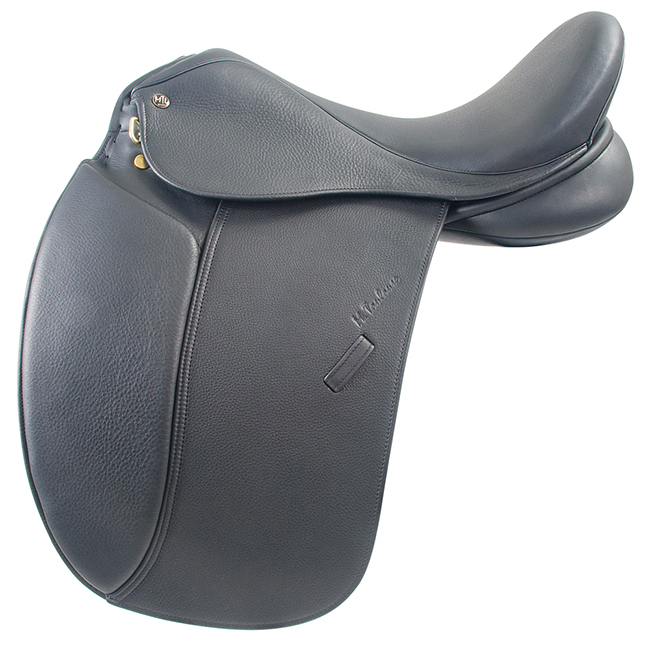 Select Size Medium 16 1/2" Medium 17" Medium 17 1/2" Medium 18" Medium 18 1/2" Medium 19"
The Aachen saddle features a deep seat that is soft and comfortable, provides support, and centers the rider's weight properly for correct balance. The mildly forward flap and is overlaid entirely of calf leather. Underneath the Soft aircushioned kneepads, the moveable/removable knee block system allows positioning for optimum comfort and effectiveness. The gusseted panels with wool and a Soft Touch comfort foam layer ensures great fit for your horse. There are 3 billet options included, 1 DRing for a point billet, 1 DRing with a billet placed under the stirrup bar that can be moved forward to the point position, and the back billet is a 2 into 1 with a swing billet system which equalizes the rear billets. The Aachen Dressage Saddle is available with a fixed tree in Medium, Wide, and XWide or the Genesis™ Adjustable Tree System, both with a 5 year limited warranty against manufacturers defects. Black Sizes 16 1/2” - 19” Genesis Adjustable Tree only, regular flap.